The grub of the California prionus beetle, Prionus californicus, feeds on the roots of perennial crops including hops and landscape shrubs. 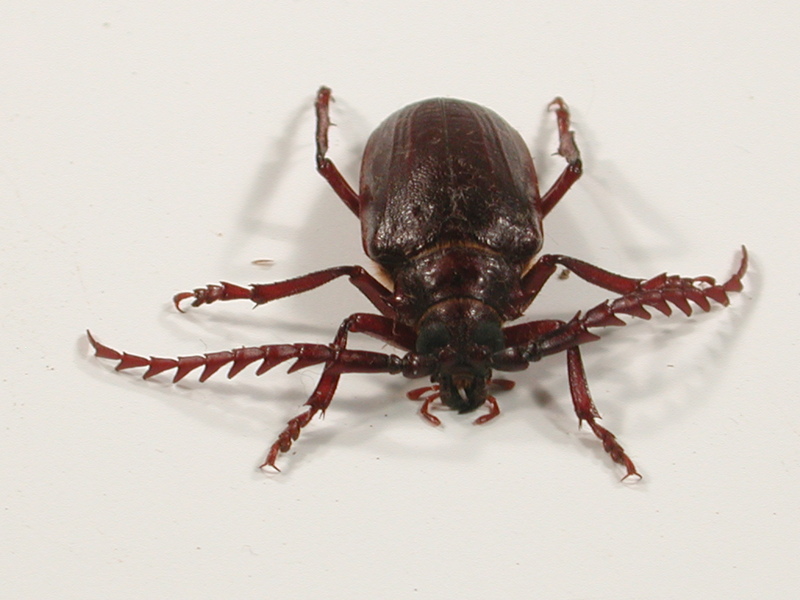 The California prionus is a Cerambycid beetle that can measure from 3.0 to over 5.0 centimeters long. 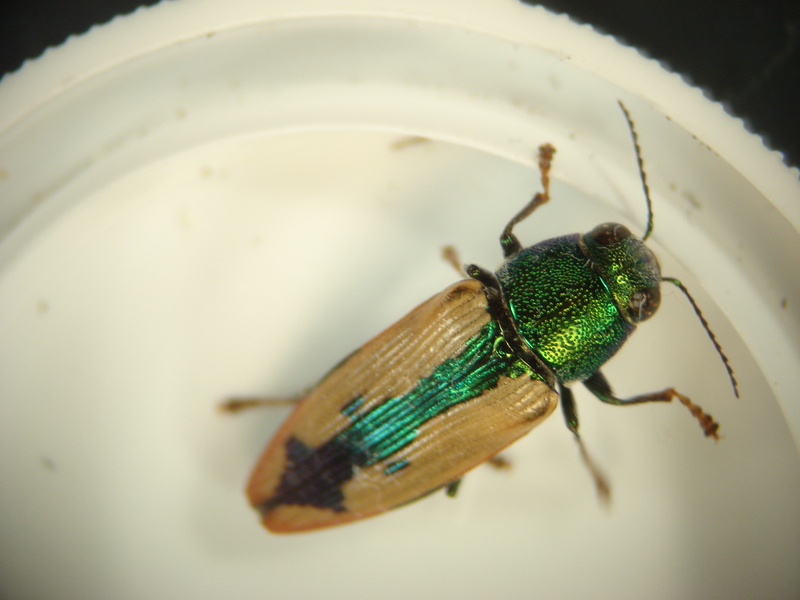 Pest description and damage Adult buprestid woodborers are oval beetles of various sizes, often with an iridescent sheen to their wing covers. Adults may feed on flowers or pollen. Adult longhorned woodborers are beetles of variable size and colorful markings that can be found on flowers where they graze on the pollen. Both families of beetles are attracted to dying and dead trees. In general, damage is secondary, and the wood borers help breakdown the wood products. These borers, as larvae or grubs, may spend several years in the wood before emerging as adult beetles. Weevils such as the poplar-and-willow borer can be destructive to willow and poplars. Willow trees can be severely weakened by the internal galleries. Many of the borers allow fungus to enter when the adult lays eggs, further assisting decomposition. Lepidopteran woodborers include carpenterworms and clearwing moths whose larvae tunnel in wood as well. Occasionally woodboring adults may emerge from firewood brought indoors. 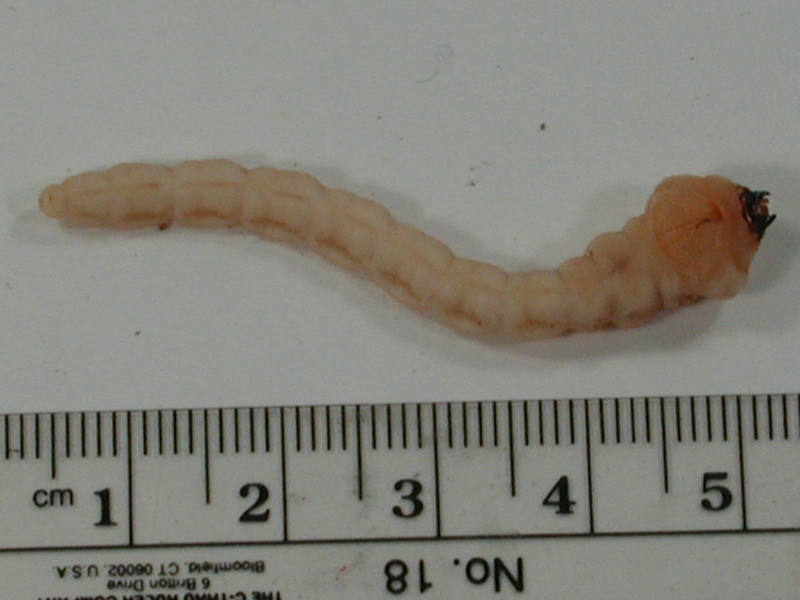 The larvae and adults also serve as food to birds such as woodpeckers, raccoons and other animals. In forestry, these insects are considered serious pests as they can cause considerable damage to timber waiting to be milled. Larvae damage the wood by tunneling through the wood leaving large rounded or flattened holes that destroy the integrity of the wood and reduces its usefulness and value as lumber. Biology and life history The moment a tree is cut, it is a valuable food source for these insects. Depending on time of year and temperature, these insects will arrive within hours of a tree being cut down or while it is dying. Life cycles are variable with the species of insect. Some insects spend many years inside the wood environment. The golden buprestid may feed for up to 15 years in wood. Adult emergence occurs when the larvae have eaten enough nutrients to develop fully and can transform to the pupal stage. The quality of wood influences that timing. In some cases, live trees are infested, but usually they are in a weakened state and unable to pitch out the insects. Pest monitoring Look for cracks or irregularities in bark, water soaked areas, holes with running sap or sawdust frass oozing out. Base of tree may be covered with sawdust. Limb breakages may occur because of weakened wood strength. To determine which species of insects are attacking the trees, the simplest method is to place sections of infested wood, or branches, in a garbage can modified to be an emergence chamber. Holes the size of pint canning jars are cut with a keyhole saw and the jar ring is pushed into the hole. The jar is then screwed in place. When the insects emerge, they usually go to the light in the jar and are held there until the jar is removed and the insects are taken to be identified. This method also traps parasitoids that may have been living in, on or with the pest. Remove the bark to reduce egg laying sites for those species that lay eggs in bark crevices. Remove dead and dying wood so populations do not build up and spread to healthier trees. Keep trees watered during drought and reduce soil compaction by foot traffic and autos. Whitewash trunks of young trees to prevent sunburn and reduce potential hazard of attack from flathead borers. Check buried roots on unthrifty perennials for damage due to construction, landscaping and bulldozing. There are several predators and parasitoids that can reduce survival of woodborers. Reduce pesticide use that may kill off beneficial insects. Pheromone traps may be deployed to draw in woodborers adults.